The Mediterranean diet is a fabulous way to eat, not just because it’s nutritious and health-promoting, but because it simply tastes good, writes columnist Carrie Dennett. May is Mediterranean Diet Month, but every month should be Mediterranean Diet Month, in my book. The Mediterranean diet is a fabulous way to eat, not just because it’s nutritious and health-promoting, but because it simply tastes good. Part of the deliciousness comes from the fact that so many countries and food cultures fall under the Mediterranean diet umbrella. The countries that border the Mediterranean Sea include not just Greece and the southern parts of Italy, France and Spain, but also Lebanon, Turkey, Morocco and several others. It’s a satisfying way to eat that also offers heart-healthy monounsaturated fatty acids, inflammation-fighting phytonutrients, gut-friendly prebiotic fiber, and a wealth of vitamins, minerals and antioxidants. The recently wrapped-up PREDIMED randomized clinical trial followed 7,447 adults at high risk for cardiovascular disease for eight years. One group followed a Mediterranean diet supplemented with olive oil, a second group followed a Mediterranean diet supplemented with nuts, and a third control group followed a lower-fat diet. The results show that the benefits of a Mediterranean diet include significant reductions in cardiovascular disease, type 2 diabetes and breast cancer. • Greens, greens and more greens. Dark leafy greens are rich in vitamins, minerals and phytonutrients, as well as plant-based omega 3 fatty acids. We don’t have access to the more than 150 types of edible wild greens found on the Greek island of Ikaria, but we can forage for “weeds” like dandelion greens and purslane and enjoy cultivated greens like kale, beet greens, mustard greens and collard greens. Add greens to frittatas, scrambled eggs or bean and lentil soups. Sauté greens with garlic and finish with a squeeze of lemon and enjoy raw salads of dark leafy greens, dressed with an olive-oil vinaigrette. • Pulses. How fortuitous that it’s Mediterranean Diet Month and the Year of Pulses! Pulses are an important part of the Mediterranean diet, especially chickpeas (garbanzo beans), lentils and fava beans. Other pulses are common ingredients in soups, stews and spreads (hummus), contributing protein, fiber and nutrients. • Herbs. Herbs are high in antioxidant and anti-inflammatory phytonutrients. Each region in the Mediterranean has a different flavor palette, but herbs and spices are universally important in the Mediterranean cuisine. Do as they do in the Mediterranean, and add fresh herbs to salads to give then an antioxidant boost. • Lemons. Lemons were brought to the Mediterranean from the Far East eons ago. The acidity and high flavonoid content of lemon juice and lemon peels may have a beneficial impact on blood sugar by slowing stomach emptying after a meal. Lemon juice is a staple ingredient in hummus, but you can also go Med by squeezing lemon juice on salads, fish, roasted broccoli and beans, or into soups and drinking water. • Nuts. Almonds, walnuts, pistachios, hazelnuts and other nuts are staples in the Mediterranean diet. Eat them on their own or chop and add them to salads and other dishes for heart-healthy fats along with protein, fiber and a wealth of nutrients. • Olive oil. Italy, Spain and Greece are the top three producers of olive oil in the world, and olive oil is the common dietary denominator throughout the Mediterranean. Olive oil is the principal source of dietary fat for both cooking and baking, and is important not just for its antioxidant and anti-inflammatory properties, but also because it makes it all those vegetable and pulses more delicious! This simple salad includes many foods that are central to the Mediterranean diet and is lovely on its own or as a side dish. 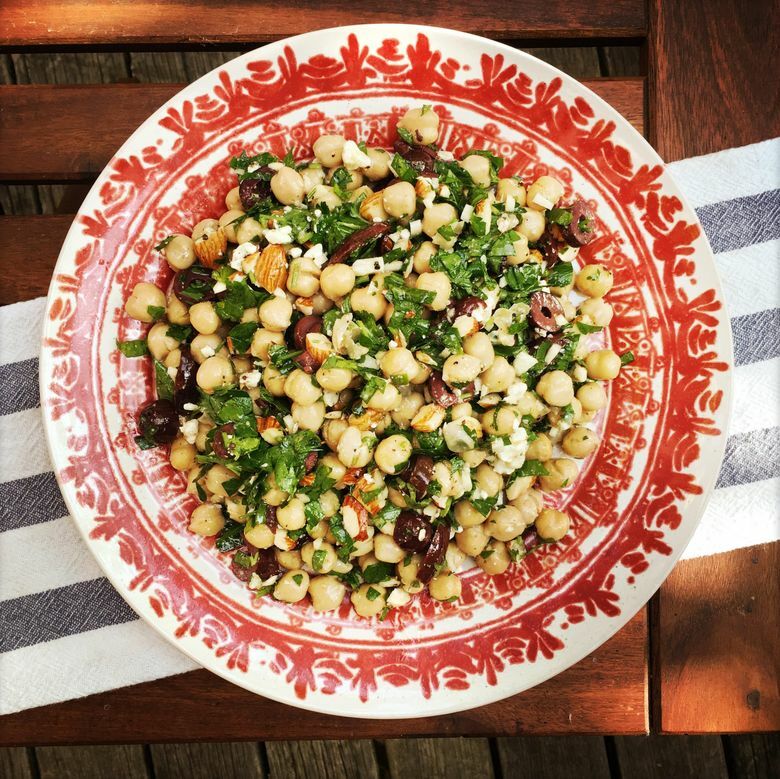 Place chickpeas, olives, almonds, feta and parsley in a medium bowl. Toss gently to combine. Add lemon juice, olive oil and garlic to bowl, toss again to coat. Taste and add salt and pepper as needed. Serve immediately or cover and refrigerate. Can be served chilled or at room temperature. 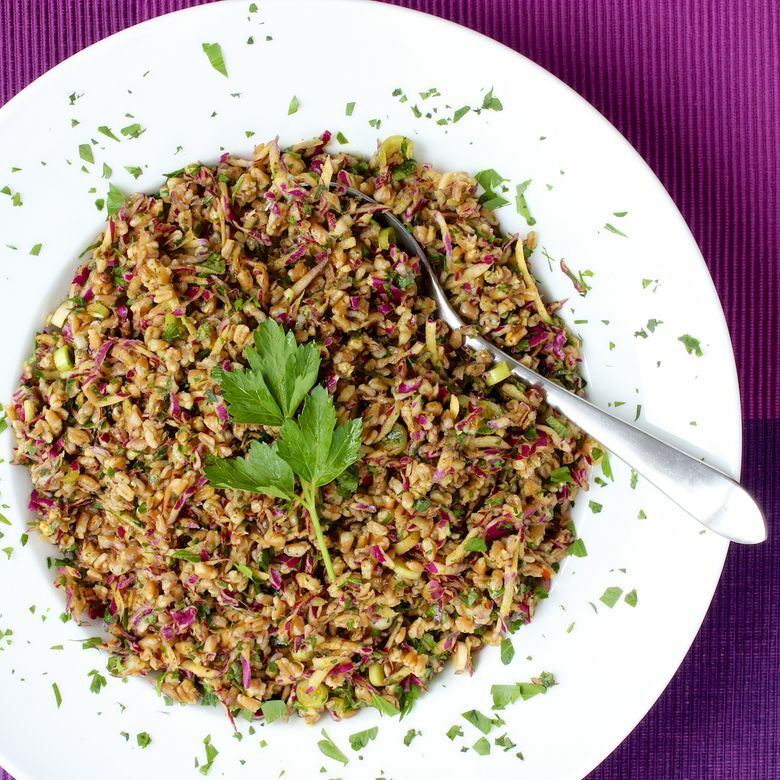 This salad is filling and flavorful, thanks to the farro and a spice-filled dressing. Cabbage adds crunch. For a different flavor, substitute packaged broccoli slaw for the cabbage. In a large bowl, toss together the cabbage, farro, scallions and parsley. In a small bowl, whisk together the orange juice, olive oil, garlic, red pepper flakes, cumin chili powder and turmeric. Pour the dressing on the salad, toss, and serve.